Are you looking for a Metal Free Implant Dentist? Zirconia Implant Dentistry has become more popular because zirconia is a biocompatible, ceramic material that completely integrates into jaw bone and is metal free. 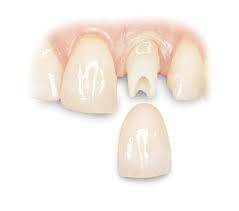 Zirconia, Metal-Free, Tooth Colored Dental Implants are placed by many Holistic Dental Offices. now Ceramic Implants are being used in many conventional dental offices as the material of choice due to Ceramic being a natural tooth color. Placing a Zirconia Dental Implant is different than a Titanium Implant, so having an experienced Zirconia Implant Dentist is important. Ceramic Implant Dentistry has gotten especially more popular because Ceramic Implant Dentists have more implnats available. We especially like the Zeramex zirconia implant that has just passed FDA approval. Ceramic Dental Implants are hypoallergenic and very Biocompatible. Some cases of Titanium Implant sensitivity show up years after surgery when itchiness and inflammation develop around implant sites. It’s a perfect setup for bone loss and the potential failure of an implant. Today, there’s a growing number of people who have allergies, skin sensitivities and compromised immune systems; therefore implantation of metal devices such as Titanium Implants should be seriously considered, especially since the removal of a Titanium Implant from jaw bone is not a simple procedure. No question, the demand for zirconia implant dentists is on the rise. The inherent problem that frequently arises with Titanium Dental Implants is an aesthetic one. Patients with thin, translucent gums or those who are prone to gum recession (as are many aging people) may end up with the gray gums or titanium showing around the margin of the crown. Since zirconia is non-metallic and white, it is much more natural looking than titanium. It’s a perfect base color that closely mimics what nature created in the first place. The color of Zirconium makes cosmetics a lot easier for the Zirconia Implant Dentist. A metal aura is visible around the gum line of the two upper front teeth with metal/ceramic crowns. In addition to aesthetic issues, the teeth were deemed Root Canal failures. The surgical treatment plan included two tooth extractions and the immediate Dental Implant placement of Zirconia Implants. After healing, all-ceramic crowns were placed onto the Dental Implants, and the final result is a beautiful, natural, Metal-Free Smile. Biocompatible material that is resistant to chemical corrosion, nor will it conduct electricity or heat. As a bio inert material, it will never trigger chemical reactions, migrate to other sites in the body or interfere with the maintenance of optimal oral health. The fact that zirconia does not conduct an electrical charge is a big benefit. Bacterial growth on the surface of Ceramic Dental Implants is far less likely to adhere due to its non-conductivity, thus creating an oral environment that promotes much healthier gums. Zirconia Dental Implants are the perfect choice for tooth replacement. Ceramic Dental Implants do not interfere with the movement of energy though the body’s meridians. And since Zirconia Dental Implants are biocompatible, they’re a perfect tooth replacement solution for patients who adhere to Holistic Dentistry principles. Give our office a call for a Ceramic Dental Implant consultation. We take pride in having four Ceramic Implant Dentists. Issues of Ceramic vs Titanium Implants need to be further explored. As Do issues of Root Canals vs Zirconia Implants. There has been a big evolution of Zirconia Implants. We Currently use Zeramex Cosmetic Zirconia Implants due to the implants high rate of success, biocompatibility and it is white and non-metal.